My attention has just been called to a letter from Vittorio Trevisan, vocal teacher of Chicago, which appears in the Musical Courier of July 27, I922, in which he makes some disparaging statements regarding my claim, being a teacher of Mary McCormic. At the time the Chicago Opera Company engaged Mary McCormic, Mary Garden, who was then the general director of the company, sent Miss McCormic to me and asked me to prepare her in the aria of Micaela from "Carmen," and Musetta in"Bohéme." She also asked me to teach her the air of “Le Roi de Thule" and the waltz from “Faust,” as well as the bird song from “Pagliacci.” I consented and Miss McCormic studied with me from that time until May, 1921. When I began to work with Miss McCormic I found that in order to have her do this work in a satisfactory manner I should be compelled to replace her voice. Miss McCormic had never been taught breathing and her voice was uneven. During this time Miss McCormic took a singing lesson with me every day and at the same time had a daily lesson in diaphragmatic breathing with my daughter, Francis Robinson-Duff. The remarkable result of her work while under my teaching can be testified to by a number of prominent people who heard her at that time. An appreciation of Miss Robinson-Duff's instruction can be found in an article written and illustrated by Miss McCormic in the Physical Culture Magazine of August, 1922. Mary McCorinic's second period of study with me was during the season of the Chicago Opera Association in New York in 1922, when daily lessons were taken from both my daughter and me. I have never claimed to be the only teacher of Miss McCormic. But I do claim to have given her the proper diaphragmatic breathing and to have placed her voice on this breath. In conversation with me, Miss McCormic has always spoken of Mr. Trevisan with great appreciation and gratitude for all he has done for her in her art. —Musical Courier, September 12th, 1922. Replaced her voice? Now, that's a turn of phrase you don't hear anymore! What Robinson-Duff means, of course, is that she taught her student correct voice placement. Linguistically speaking, this terminology echoes the teachings of the old Italian school of singing as expressed by students of Francesco Lamperti and Manuel García during the early part of the 20th century, terminology which sounds increasingly foreign to our ears. Breath and brains are the qualifications most necessary for a singer. —Sarah Robinson-Duff, Obituary, New York Times, May 12, 1934. Robinson-Duff's obituary tells readers of her birth in Bangor, Maine, having descended from John Robinson—a Pilgrim minister, but curiously omits the year of her birth. Whether this is the result of vanity or reporter oversight is not known. Whatever the case, Robinson-Duff kept the Robinson family name after marrying Colonel Charles Duff at the age of eighteen. 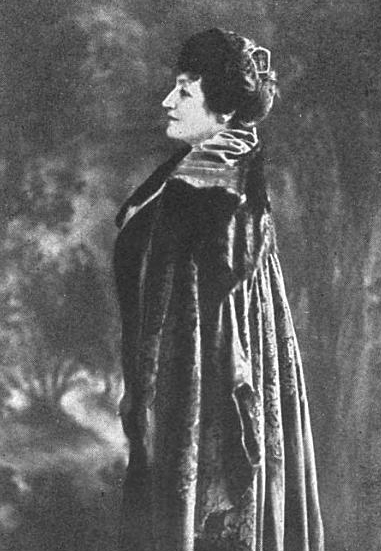 Robinson-Duff studied voice with Mathilde Marchesi in Paris, and made her mark as a teacher of singing; first in Chicago—where she encountered fourteen-year old Mary Garden—her first pupil; then in Paris, where she taught for more than two decades before fleeing the City of Lights for New York in the wake of the first World War. Her many students included the aforementioned Mary McCormic, Alice Nielsen, Jessie Bartlett Davis, Fanchon Thompson, Nora Bayes, Olive Fremstad, Frieda Hempel, and Florence Page Kimball, the teacher of Leontyne Price. Robinson-Duff's daughter Frances (1877-1951) kept the family name and taught her mother's vocal method to many actors, including Kathryn Hepburn, Henry Miller, Helen Hayes, Dorothy Gish (sister to Lillian), and Norma Shearer. Those curious about the Robinson-Duff-Marchesi method can find relevant material at the New York Public Library of the Performing Arts at Lincoln Center. Thus we went around from studio to studio. One asked me to do this—to hum—to make funny, unnatural noises, anything but sing. Finally, Trabadello, now retired to his country home, really asked me to sing in a normal, natural way, not as a freak. I said to myself, “This is the teacher for me.” I could not have had a better one. I have always believed in a great many scales and in a great deal of singing florid roles in Italian. Italian is inimitable for the singer. The dulcet, velvet-like character of the language gives something which nothing else can impart. It does not make any difference whether you purpose singing in French, German, English, Russian or Soudanese, you will gain much from exercising in Italian. —Mary Garden in Great Singers on the Art of Singing (1920) by Harriet Brower and James Francis Cooke. Note: Garden's teacher, Mrs. Sarah Robinson-Duff, was a student of Mathilde Marchesi, and wrote an interesting book, Simple Truths Used by Great Singers (1919), which will be the subject of a future post. In the old Italian school of singing nothing used to be more admired and cultivated than an absolutely steady tone. To-day even in Italy a strong vibrato or a quivering tremolo is generally preferred. Consequently, the modern Milanese 'maestro' encourage it. Whether a trembling tone can ever furnish a satisfactory medium for the singing of Mozart is another question. We have evidence, both internal and external that the voices for which Mozart wrote did not suffer from this particular drawback. The sin did not become common until some years after it had started at the Paris Opéra in the midway of the last century Meyerbeer, Auber, and Gounod openly expressed their detestation of it. In alliance either with a strain of pure melody or a declamatory passage, a trembling voice, no matter how pleasing its quality per se, has always sounded disagreeable to the ears of an English audience. Intelligent use of the method of breathing described above practically obviates all danger of an unsteady tone. Instinct for the exactly right amount of breath-pressure should be natural to the good singer and made reliable by practice and experience. It contributes, moreover, to the liquid purity and clearness of timbre resulting from an undisturbed adjustment of the vocal cords. This economy of breath and this adjustment are interdependent, since the muscles of the throat respond and resist automatically in exact proportion to the varying degrees of pressure from the lungs. Yet the need for care does not end there. The singer intent upon the tone must not think of the throat, but of where and how the tone itself is reflected or placed: that is the true point d'appui. It follows that a perfect sostenuto can only be obtained when the singer has the sensation of direct and uninterrupted great support extending from the region of the diaphragm to the area of resonance. Readers of Herman Klein and the Gramophone can learn quite a bit about his thoughts on vibrato, which is what I did by going to the link above, using the "search" feature on the left-hand side of the screen, then pulling down my hard copy edition from the shelf. Type in "vibrato," and you will find twenty-five citations within Klein's text. What does one learn? Well, for one thing, it becomes clear that Klein thought of vibrato in a negative context, that is, he observed its aural character to be at variance to the normal vibration found in the singing voice. This is made clear in the citation appearing on page 221. Another warning—addressed this time the English male soloists. They are too much out for volume. Perhaps it is because they are mildly jealous of the foreigner, with his bigger voice and freer production. Anyhow, their tone sounds a great deal louder on the gramophone than it does as a rule in the concert-room or even in the opera house. They appear to be standing quite close—much too close—to the microphone, and, by using excessive breath-pressure, they either detract from the natural beauty and purity of their voices or else they set up a vibrato which is not a normal feature of their singing. In this matter, as I think I have observed before, the microphone is more relentless than a highly-polished mirror. It shows up every defect to which the human voice is liable; and I regret to add that the habit of making the tone unsteady by careless or unskillful breathing is one of the commonest of those defects. Excessive preath-pressure? Well that makes sense, don't you think? Klein also attributes "vibrato" to breath-pressure on page 452 when referring to Tancredi Pasero's singing. The bass delivered the broad theme of King Henry's Prayer, and from the lips of Tancredi Pasero it sounds very broad indeed, despite the rapid vibrato of his (due to excessive breath-pressure) which is his only serious fault. Otherwise, he is in the front rank of Italian "singing basses." Fortunately, we are able to hear just what Klein was referring to at Youtube! Click on the link here, and you will hear Pasero sing the very recording Klein reviews. By way of comparison, Klein has nothing but good things to say about Titta Ruffo's singing on page 79, where he reviews Ruffo's rendition of the Prologue from Leoncavallo's I Paglicacci. Listen to it here. It is a magnificent organ, properly produced, amazingly resonant, free from nasality or vibrato, and controlled by true diaphragmatic breathing. The power and opulence of the tone strike the listener from the instant he sings the "Signore, signori"; and you can even—rare event! —catch the hissing of the "s" as well. In each successive phrases there is an abundance of expression ample contrast, and not a hint of exaggeration. To teachers who use the gramophone I would say, "Here is your perfect model!" I may even add my opinion that this is how Santley in his prime would have sung the Paglicacci Prologue. And praise can go no higher than that. What does one hear in Ruffo's singing? A vibrating tone, which is quite different than Pasero's vibrato. One also hears the sostenuto which Klein refers to in Bel Canto, which he considers a matter of correct production, one requiring steadiness. We can take from this that Klein's sostenuto does not mean straightened tone, which, by its very nature is limiting to vocal function. In short: steady does not mean straight! Others are welcome to disagree, but if we take Klein's teaching as having descended from a direct line of voice teachers stretching back to Nicola Porpora (Klein's teacher was Manuel García, who's own father—also Manuel—studied with Giovanni Anzani—a student of Porpora), then we will want to review Baroque performance practice, which has been straightening out vocalists and orchestras since the 1960's. Happily, the whole matter seems to be under revision. Click here for another perspective. 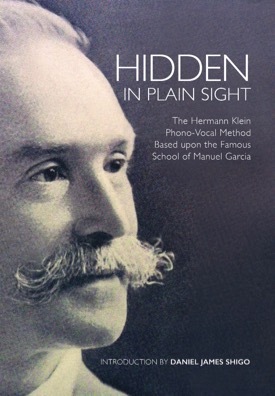 Note: January 20, 2016: Alert readers will know that Klein taught that the "true point d'appui" was the "mask," a controversial concept that is dealt with in-depth in the introduction and text contained in Hidden in Plain Sight: The Hermann Klein Phono-Vocal Method Based upon the Famous School of Manuel Garcia. This is a remarkable book which features the work of Paul Madaule, director of the Listening Centre in Toronto, Canada, which is based on the work of Alfred A. Tomatis, a pioneer in psychoacoustics. What can the student of singing gain from this book? Well, for one thing, a good deal of information regarding the plasticity of the brain. 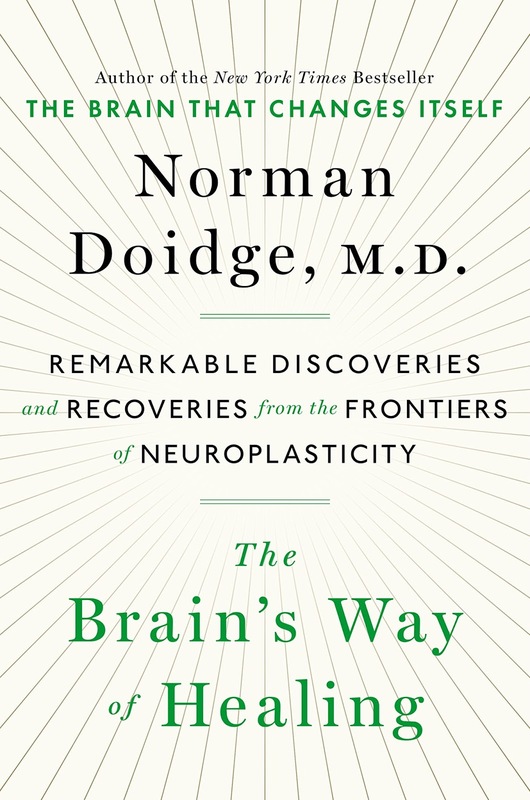 For another, an under-the-hood view of how we learn—and how the body and brain are connected. Reading it, you begin to understand why Tomatis said curious things like "Your back is your ear" and alternately, "Your ear is your back." I experienced Tomatis' observation myself after beginning my own course of listening training in Toronto in 1999. At the end of the first week, I observed that my neck had been elongated—stretched up and back, so much so that my muscles ached. I also felt a huge change in the base of my tongue—as though someone had reached into the back of my mouth and untied a knot, the consequence of which I felt an intense ache from the tip of my tongue all the way down to my collarbone. All this from listening to filtered music, which changed the relationship between the muscles of my ears and body. My speaking voice changed of course, as did my singing, both of which became more fluid and full of timbre. I know this blog to be a result of my listening training experience too; singing, speaking and writing involving self-listening, the training connected the dots—or as I sometimes tell people—moved the furniture in my head, which found expression on this page. Such is the power of sound. This book is full of stories of real people experiencing real change. As a companion, I also suggest you read Paul Madaule's excellent book When Listening Comes Alive. Taken together, you will have a better understanding of Tomatis' revolutionary work and its application to the art of singing. EIGHT years ago, preparing for a course of study abroad, my great objective point was Italy; circumstances intervening, five years went by before my face was turned Europe-ward, and then not to Italy. Why? The then rapid decline of Italian opera, the new Wagner craze, the superiority of German music generally, and some minor causes, sent me to Dresden, for there was the happy combination of an Italian-method teacher, and the finest opera in Germany. Time has proven that my selection was wise. With the maestro, G. B. Lamperti, son of the celebrated Francesco, of Milan, my studies were begun, and from the first lesson to the present time, I have no reason to regret it. He is one of the last of those truly great teachers who believe before playing upon an instrument, it should be put in order. Each tone is first built up, until the voice is a beautiful, complete whole. This is no easy matter, requiring patience on both sides, and confidence on the part of the pupil; but the average American student of moderate talent seeks a so-called "quick method," being discouraged if in a year he be not a fine concert singer, or able to make a good church or opera engagement! If as Sim Reeves is reported to have said to an ambitious American mother, it takes seven years to make a shoemaker, what can you expect to do in a few months with an instrument hidden in a dark corner of the body, neither able to be seen nor handled? Dear Editor, it is time this ignorance regarding the voice be dispelled. An average mother will give her daughter eight to ten years of piano-instruction; but request her to give three years for voice-cultivation, and she wonders what it is all for. It takes years to train the other muscles to their proper uses, why not the delicate throat-muscles? Lamperti is censured for being slow and "old-timer." Thanks to him, I am happy to say he is, if slow consists in demanding at least three years to perfect a singer. A more careful, painstaking, conscientious, capable teacher I cannot imagine; but the modern idea, which wants everything done by touching an electric button, had better pass him by. He laments the decline of the art of singing, saying it is impossible with the present prevailing ideas to produce the artists of 100 years ago. Lamperti's price is 100 m. (about $25) a month, for two half-hour lessons a week, which is less than Henschel, Rangegger, of Shakespeare, in London, or Marchesi, in Paris. The latter is growing very passé, and, I am told, has a temper simply unbearable. Students are now giving preference to La Grange or Artôt in that city. The question of where to go and to whom, puzzles many. Shun Italy. The older Lamperti is almost eighty, and gives few lessons; Vannuccini in Florence knows nothing of voice-building; and Vannini has not reputation enough, even if he has a good method. A lady recently returned from Florence states that she was not able to find one good teacher there, and Milan was equally destitute. This dearth of teachers is not the only bad side of Italy; the opera is deplorable, music generally being very clap-trap, while the climate, with poor heating arrangements, offers another objection. I should advise Paris, London, or Dresden. Dresden is full of American pupils, it being far ahead of Berlin in vocal advantages. The conservatory is especially good, principle among the teachers being Fraulein Orgeni, pupil of the older Lamperti. She is very popular and does fine work. The opera house is the third finest in Europe, and the opera excellent. The "divine Malten" stands at the very head of the great sopranos, and Scheidemantel ranks as one of the finest baritones in Europe. Opera is cheap, costing from twelve cents to $1.25, and is a fixed price. The fourth gallery is the great American resort; seats cost from .25 to .50, and, the music sounding is better here than in any other part of the house, it is always crowded with students, and tourists who do not care to make a toilet required for the parquet or first gallery. Hats are never worn in either concert or opera, and one is compelled to give up coat and umbrella for a small fee. Living is expensive, four marks (about $1) being the very least for which one can find eatable and sleepable board. A piano student can tuck himself away in some cheaper place; but a vocalist needs, above all things, a sunny room and good table. London is much more expensive while the fog and other disagreeable features of the climate are a great drawback; but that is the place for English ballad and oratorio. Shun the "German method" teacher. He generally has a bundle of Italian exercises in his hand (either Borgogni, Marchesi, or Lamperti), a German heart beating in his bosom, and a German vowel sticking in his throat! He is not the man for a bright student who wishes to improve, beautify, and best of all, preserve his voice. I reasoned in this manner: The method which developed a Jenny Lind, a Sontag, a Patti, and, in fact, all the greatest singers, was good enough for me; why seek further? The Germans, as a class, are opposed to the vocal trill or cadenza, saying it is soulless and foolish; yet they spend hours in acquiring a trill upon piano or violin, an dappled a Sarasate or Carreno vociferously for something fine in that line. There is no talk of frivolity then, I notice, and lack of soul enters not in the conversation! I am afraid (tell it not in Gath! ), I am afraid they are not consistent. I would advise my American friends who contemplate a course of study abroad, not to come for only one year. They will be disappointed, as in that time only a beginning can be made. The sad and unhappy girls who return half-finished after a twelve-month her are legion. Werner's Voice Magazine, June 1891. ONE of the first surprises I had in beginning my singing-lessons was that the exercises were not given piano. I said to Lamperti: "I have read a great many books on Italian method, and they all concur in one point, and that is that the old Italians began voice-training piano; why do you not do so?" "For the simple reason," replied he, "that to sing piano well is the finishing touch of a singer; why begin at the end? If you were teaching violin or any other instrument you would not require your pupil to play a tone first piano, would you?" I acknowledged the sense of his reasoning and know he is right. Sing naturally first, neither piano nor forte, and with a proper management of breath, both of these will be a easy matter afterward, if you have a voice; if not, don't waste your time taking singing-lessons. Better bestow the money on the poor. A second surprise awaited me in the registers—head-tones began at C#! I had had three different teachers in America, so-called "Italian-method," but they compelled me to run my middle notes up to F#,—a sad mistake, narrowing the voice down and injuring the quality. Werner's Voice Magaine, July 1891. T he room in which Mr. Wheeler teaches at the New England Conservatory of Music is in striking contrast to his beautiful studio on Tremont street. It is well lighted, but besides the grand piano and chairs, there is no other furniture. A few Japanese trifles are about the only attempt at decoration. As the class take their places at the side of the piano, Mr. Wheeler seats himself and talks to them. He tells them the two great principles of Voice-cultivation are these: First, as you diminish the tone, open it; and, second, make the voice round as you ascend, that is, pyramidal in shape, broad at the base, round at the top. No matter what the voice, whether bass or soprano, thin or sombre, these two things must be studied constantly. The great representatives of the Italian school, Garcia, Vannuccini and Marchesi, all agree on this point. The exercise used for opening the voice as the tone is diminished is oh, blending into ah, sustained up and down the scale. This distributes the force equally through the throat and head. In an experience of 30 years’ teaching, he has almost always begun a lesson with this exercise. It is sung by the class, within the medium range of the voice. “Be careful not to close the month until the sound has entirely died away,” he cautions, and repeats his opinion of the value of the exercises: “If I were to die and could leave only two things on record about voice-culture it would be those two," are his earnest words. Then the study of Vaccai's exercises are taken up. The class practice reading Italian at first, then sing the first four exercises “Try and infuse some sentiment or feeling into everything you sing, be it scale, song, or study," is his advice. The lesson ended, Mr. Wheeler recapitulates tersely what he has said. One young lady asks if it is a sign that she is singing wrongly if her throat aches after singing. Mr. Wheeler replies: “If you have been singing in a wrong manner and have come to a sensible teacher, it is only natural that the muscles should tire easily when the method is changed. If sore throat sets in, it is a sign that you are singing wrongly, or that your throat should be in the hands of a physician. Never sing with a sore throat.” The bell rings, the class pass out, and the lesson is over for the day. 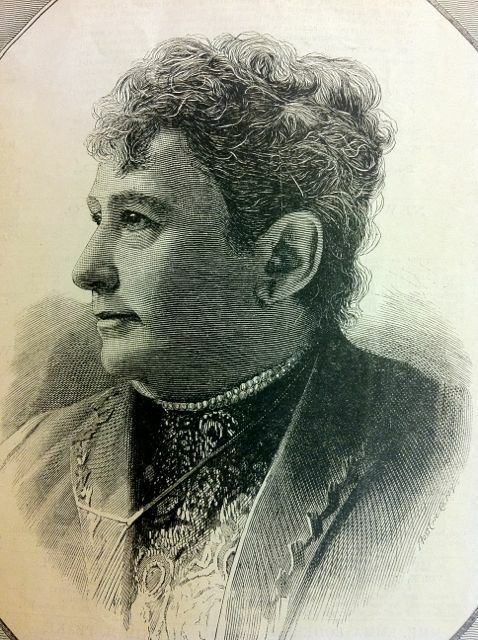 Susan Andrews Rice, "A Lesson in Voice-Culture by Mr. Lyman W. Wheeler," Werner's Voice Magazine, November, 1891. 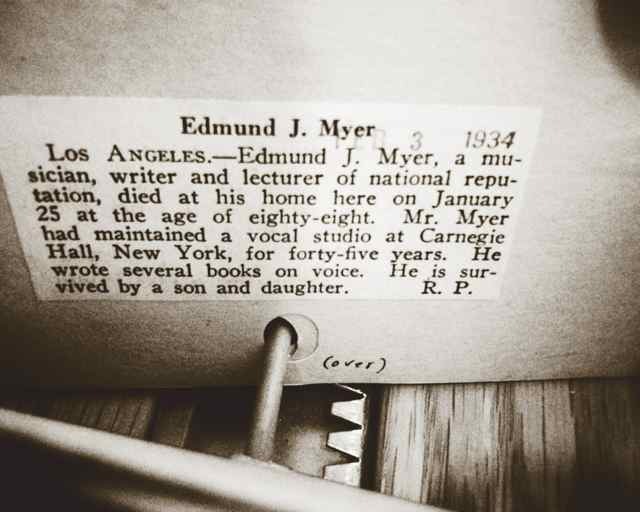 Note: Lyman W. Wheeler was a student of Manuel García and Domenico Scafati, a highly successful tenor, and faculty member at the New England Conservatory of Music. For more information, click on his label below. 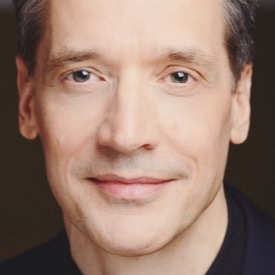 One of the most popular and successful teachers of singing in Boston is Mr. Lyman Warren Wheeler, who has been connected with the New England Conservatory of Music since its foundation. Mr. Wheeler was born at Swampscott, Mass., a fashionable watering place and summer resort, in the spring of 1837. When about ten years of age he began his musical studies under the direction of Mr. C. A. Adams, of Lynn, Mass., with whom he remained four years, at the same time taking a few lessons on the piano and organ, and attending the common school. At this time young Wheeler possessed an alto voice of remarkable sweetness and unusual compass, singing three octaves without any difficulty. He received many offers to join concert companies, but his father, with great good sense, realizing the delicacy of a young voice and the readiness with which it may be entirely ruined, preferred to keep the boy at home at his studies. At the age of seventeen he went to Boston, ambitious to acquire the best musical education obtainable, and in the spring of 1853 he entered the Philharmonic Institute, where he remained two years. On leaving the institute he continued his studies in vocal music under the best English and Italian masters, and in September, 1857, he started for the west, and began teaching in different cities. During the winter of 1857 Wheeler had no fewer than 900 pupils whom he met every week. He officiated as conductor of several musical societies, and has held musical conventions in many of the principal western cities. In September, 1860, Mr. Wheeler sailed for Europe with the intention of placing himself under Garcia, the preceptor of Jenny Lind, Malibran and many other famous vocalists. He entered the Royal Academy of London, Garcia being at that time the head of the vocal department of that institution, and after devoting a year to the most arduous study of the art of singing, he repaired to Milan, Italy, where he began with Prati and San Giovanni, with whom he remained eighteen months, during a part of that time taking two or three lessons each day. At the suggestion of Garcia, he then sought the guidance of Scafati, a famous teacher at Naples, with whom Mr. Wheeler studied for five months. During his stay in Italy he studied and committed to memory the principal tenor roles of a large number of grand operas. Returning to London in 1863, he reviewed all his past instruction with his old master, Garcia, besides studying the oratorios with Smith and Perrin. At the queen's concert rooms, and also at the concerts of the Royal Academy Mr. Wheeler sang with distinguished success. He returned to his native country in August, 1863, and accepted the position of tenor in Emanuel church, Boston. His first public appearance was with the Handel and Haydn Society, when they first sang in Boston music hall with the great organ of that auditorium. Mr. Wheeler sang the tenor roles in many productions of oratorio in Boston and other cities in New England, meeting with the highest praise from the critics and the public. As a teacher he soon found all his time taken up, and he was obliged to give up singing in public, to devote himself to his class. At the foundation of the New England Conservatory Mr. Wheeler was asked to become one of the faculty, and to that splendid institution he has devoted himself and his best efforts ever since. He has graduated some of the best singers that America has produced, many of the famous artists of the day having obtained the foundation of their success under his guidance. Mr. Wheeler usually spends his summers in normal work, in different parts of the country. For some years he was associated with Mr. Wm. H. Sherwood, in summer schools of this kind, whereby his influence is more widely extended. —A Hundred Years of Music in America, 1889, page 16-17. 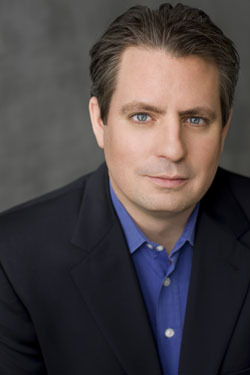 J. Harry Wheeler is one of the prominent voice teachers in the United States. His pupils may be found filling responsible positions in nearly every large city in the country. Many of them are on the grand opera, oratorio and concert stage. Mr. Wheeler has been the principal of the vocal department at the Chautagua N.Y. Summer School of Music fifteen year; he was principal of the vocal department at the Northwestern University; principle of the vocal department at Tufts College, principal of the Boston Normal Musical Institute; was voice teacher and lecturer on vocal culture in the New England Conservatory of Music, Boston, thirteen years; voice examiner in the College of American Musicians; special voice examiner at the Toronto Conservatory of Music, Canada, 1901. Mr. Wheeler is the author of the most concise work published on vocal physiology, adapted to the requirements of voice teachers and singers, entitled “Vocal Physiology and Singing,” published by the New England Conservatory of music, Boston, Mass; also author of “The Voice and Kindred Topics,” &c. In his student days Mr. Wheeler was a pupil of the famous singing master, Manuel Garcia, London, England, the teacher of Jenny Lind, Malibran and many other world famed artists. In Italy he studied with the renowned maestro de canto, Lamperti. Both of these eminent masters taught strictly the Italian method of tone production which Mr. Wheeler unreservedly and enthusiastically pursues in his teaching of voice placement. Mr. Wheeler fully endorses those in this picture group. The voice teachers educate voices strictly in the Italian method, and may be relied upon as safe, reliable and first-class teachers. —Musical Courier, January 8, 1902, Page 18. Two men with the same last name, one of them studying with García, the other with both García and Lamperti. After finding the articles above, I wondered if Lyman and Harry were related. Since the one about Lyman gave crucial information regarding his place of birth, it became a matter of tracking down more information about Harry—which led me to his book that referenced Francesco Lamperti, as well as an article which apologized for confusing the two men—who were brothers. I subsequently discovered Harry and Lyman Wheeler were born a year apart in the 1830's. Both brothers studied with Manuel García and taught at the New England Conservatory of Music (Lyman taught on the faculty from 1868-1882, then 1885-1893, while Harry taught voice from 1882-1887). Lyman was the younger of the two and had a higher profile, which may be explained by Jenny Lind remarking that Lyman was one of the best tenors she had ever heard—there being no mention of Harry's voice at all. Was there rivalry between the two? It's hard to know, but one wonders, since Harry taught at a succession of schools, while Lyman stayed at the New England Conservatory. Lyman also kept his pedagogical allegiance to García, while Harry left the father of voice science for Lamperti—García's great rival. In the end, Harry outlived his younger brother, who dropped dead at the age of sixty-three. Harry left the planet nine years later at the age of seventy-three, having married a twenty-two year old student when he was fifty-six—not unlike his famous teachers who also married much younger students. He spent the last decade of this life in New York City, teaching privately and giving lectures on the voice and vocal physiology. Like García, Harry used a model of the larynx, and presented himself as a vocologist a hundred years before the word was coined. Harry's book, Vocal Physiology, Vocal Culture and Singing (1883), is a fascinating document, which, on close examination, reveals itself to be an expression of Old Italian School teachings. I encourage the reader to mine its gold and heed Wheeler's sound advice. Notes: The spelling of "Scafati" has been corrected in the article on Lyman Wheeler, having been incorrectly written as "Skafati." Harry Wheeler's book is also at the Hathitrust Digital Library, which can be found here. I also wish to thank New England Conservatory's archivist Maryalice Perrin-Mohr for providing the Wheeler brother's dates of employment on the NEC faculty. Francesco Lamperti, the last of the really great masters of the voice, has passed away after sixty-two years of uninterrupted instruction, from 1830 to 1892. Small wonder that his name has become a household word among musicians and the music-loving people of all civilized countries. What a veritable wizard that tiny, shriveled-up old Italian, inseparably accompanied by his bamboo stick, seemed to the awestruck aspirant for future vocal honors: Think of studying with a man who had been the intimate friend of Rossini, Bellini, and for years the associate in the royal conservatory of Milan, of Lauro Rossi, Donizetti, and Mazucato, whose critical opinion was listened to with deference way back in the days of Frezzolini, Pasta, Malibran, for whose pupils Verdi and Donizetti and a score of others Italian composers of minor fame composed opera. Lamperti's experience of singers and the art of song literally dated from his birth as he was the son of an Italian singer of some reputation, and during the first part of his life often figured on the stage in processions and otherwise. His mother's voice, however left her after an illness. In a few years she opened a school for lace embroidery, making the fine black mantillas worn as headgear by the Milanese ladies, and also the elaborate gold embroidery used in priests' vestments. The skill which Lamperti derived in assisting his mother in this work served as his only means of support during eight years of bitter poverty at Milan, while struggling to obtain his musical education. Soup and bread was literally his diet for months at a time: as the old man graphically said to me: "When I was young and always hungry (con un appetito del diavolo) I had nothing to eat. Now that my table is covered with everything I attempt the appetite, behold, it is varnished!" At the age of seventeen he secured a place as organist in one of the churches, and soon after this became the orchestra director of the Theatre Filodramatico, the National theatrical school, from the boards of which nearly all the great actors of Italy have graduated. From this dates Lamperti's career as a singing master, as his fame as accompanist began to attract the attention of the great number of operatic celebrates constantly to be found in Milan, and it grew to be the fashion to practice daily with the young, red-haired Lamperti, who was nicknamed in those days "Il-Rosso." Thus the young Lamperti, through his known influence with the renowned singers of the first part this century, came to be regarded as an authority on all matters pertaining to the art of singing. He opened a successful operatic agency in connection with his singing classes, which was in later years carried on by his son, Nino Lamperti. His parlors were daily thronged by great singers, some waiting to be heard by agents from London, Madrid, Paris and St. Petersburg, while others were waiting their turn for their lesson from the already famous maestro. Lamperti's inherent greatness has forced a recognition from the civilized world, in spite, as it were, of himself, for of all unpractical geniuses he could easily take the lead. True, he was associated with the Royal Conservatory of Milan for twenty-five years as head master of the department of singing, but this offer, which meant position, worldly fame and a future pension, an honor eagerly sought for, was refused by him for a long time, so great was his dread of being bound by a business contract. He subsequently, on two different occasions, absolutely refused offers made to him by Gounod, Ambroise Thomas, and others to become associated with the world-renowned Paris conservatory. Rossini, his lifelong friend and corespondent, remonstrated with him, receiving for answer: "What do I care for glory, I don't like the French." Ambition he never possessed, simply an intense love for music, combined with marvelous critical powers. His sensibilities appear to have became absorbed by his music. He was absolutely devoid of family feeling, and on being told of the death of one of his grown sons, said in a matter-of-fact tone, "You don't say so," and continued his lesson. But the tears would come to his eyes every time he would describe some pathetic aria or hum a musical phrase as sung by one of the great singers some fifty years before. At a recent visit to my old maestro at his villa on Lake Como I was much impressed by the childlike indifference to fame of a man who had instructed three generations of great singers. His wife showed me a dozen different decorations given to him by royalty in recognition of his invaluable influence in preserving the almost lost traditions of the Italian art of singing. "You should not allow all these amateurs and would-be teachers of your method to study with you unless they remain with you two or three years at least," I urged. "Why not follow Marchesi's example? Do not accept a pupil until he binds himself to remain with you until he really sings as you wish him to. Think of the ridiculous statements which these so-called pupils of Lamperti make about you and your method." "What do I care?" answered the old man. "It has been my habit for sixty years to see pupils before me from morning till night. I make enough to eat and drink and live in comfort. I never in my life planned ahead of the coming day's lessons, and yet look at the result of my work," pointed with his magic wand to the pictures from many lands, each with enthusiastic, frequently reverential inscriptions to their "immortal maestro." When I went to Lamperti to study, Albani gave me the hint that William Shakespeare had found it necessary to listen to his lessons from morning till night to get at the spirit of his teaching, and, profiting by this hint, I accompanied the maestro's lessons for three years, hovering about him to such an extent that he nicknamed me the "fly" and "polyglot" for the fact that I served as useful translator for the many nationalities represented in his studio. It was truly the only way to gain a knowledge of his method. In the first place, the old maestro spoke nothing but the Milanese dialect so totally different from pure Italian that I frequently translated his meaning to Italians! Once his dialect understood, an impossible feat to almost all of his pupils, as it was mumbled between a set of very loosely fitting false teeth, their troubles had only begun, for it seemed impossible for him to give a plain matter-of-fact explanation. The native wit and exuberance of the fiery little old Italian wizard found an outlet in constant similes and metaphor, often lending the perplexed student miles away from the idea which he wished to convey. For instance, instead of using the practical term "Breath deeply," he would say "put it down" (giu"). Instead of saying "breath quietly," "take in the breath quietly," he would say "drink" ("bevi"); while after an unusually ferocious rap with that much-dreaded cane the pupil would be told that "the boat was under the water," and in many instances it was only after years that the pupils would realize that by "boat under the water" he mean that they were exploding their tones without being properly sustained by the breath. "Scappa" ("it runs away") was constantly given as an explanation of a rap from his stick, or "balla" ("the breath is dancing"), and the bewildered student would suffocate his tone in deadly fright of that stick and another furious outcry, only realizing that something was going wrong and the maestro was in a rage. Thus it will be seen that it was something like solving a Chinese puzzle to understand what the autocratic old maestro really meant. It would have been difficult to find a more exacting, impetuous and positively maliciously wide-awake musical martinet than Lamperti for fairly imperceptible faults in tone, time or expression. I have mentioned the abominable dialect which he spoke himself, but in singing he was simply maddening in his determination to hear the purest Italian. Often the pupil would not get beyond a half-dozen words of a recitative during an entire lesson, every inflection, every letter, being repeated before he would rest content. Italian was for him the only conceivable language for the soul; every one was commanded to speak only Italian between the lessons, with sublime indifference on his part to the fact that many of his pupils did not know enough of the language to ask their way about! The babel of languages which had been heard in his studio for sixty years had only served to increase his contempt for anything but his beloved Italian. And how he execrated Wagner and his influence on the singing voice! The German language to this mind conveyed a sense of fog and discomfort. "They are sclum, scluming it again," he would say, on hearing pupils talking German to each other. As for French, "it closed the throat and made squeaky voices like marionettes." He delighted in calling English "La schiuma" ("the scum of the languages"). He used to repeat the following story about the origin of the English language to every new English or American pupil: "When the good Lord was mixing the ingredients for the languages of the various peoples of the earth, he forgot all about the blond-haired English on their distant Island. When reminded of them He said at first that they would have to continue talking like birds, as His caldron was full. Suddenly He bethought Himself of taking off the scum. "There, said He, "we'll give that to the English; it is good enough for them." Very characteristic were the old master's description of his impression of the English. The whole nation seemed to him dead and buried, and resurrected by some mistake. "Think of saying "I love you" with face and eyes as devoid of expression as that of a dead fish!" During the first forty years of Lamperti's teaching, from 1830 to 1870, none but prospective artists or great operatic celebrities ever undertook to study with him. In 1870 he married a second time, a young German, the cousin of E. Werner, the celebrated German novelist: a Madonna-like German blonde, whose absolute devotion to the spider-like Italian, sixty years her senior, has been a positive psychological problem, a source of never-ending wonder to his students. With her advent, something like order was introduced in the utter confusion which up to that time had prevailed at his lessons. The former class lessons at which, though all paid alike, only the talented ones received the maestro's full time and attention were relegated to the past, each pupil receiving the time agreed upon, and with a firm hand the crowd of singers were swept away who had been once been wont to spend their leisure days in Lamperti's studio. 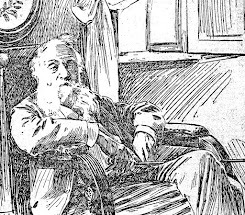 Through the young wife's influence, the old Milanese maestro, who had boasted that he never would go beyond the shadow of the Milan Cathedral was coaxed to go to London for several spring seasons and subsequently it became his habit to spend his winters at Nice, Rome, Milan, Paris, Venice or some one of the capitals, summoned to "coach" artists singing in the principle opera houses. In these wanderings of his old age, like some prophet of old, Lamperti has been accompanied by a perfect tribe of pupils and their attendant families. It was owing to his first season in London, in 1876, that the influx of English and American students first appeared at the studio, and through them came the wealthy or titled amateur, always regarded by Lamperti with a cynical politeness which veiled contemptuous indifference. The worst feature in the last fifteen years of Lamperti's teaching has been his utter indifference as to the spirit in which his instructions were received. Yet what a constellation of famous artists has been evolved by his genius! A veritable artistic milky way! Let me give some of the names which I copied, either from the portraits in his studio or from his book, dating back to 1830. Among these first names I noted Patti's father and mother, about 1835. Then a picture of Clotilda Patti, a sister of Adelina's, and subsequently, with the date 1845, a picture of Nicolini, her husband. Ortolani Tiberini, Desiree Artot, the famous Cruvelli sisters, Angela Peralta, Angelica Moro, Paganini, Galli, Risarelli, Angeleri, Aldigheri, Vialetti, Marinani, Parlmiere, Everardi. 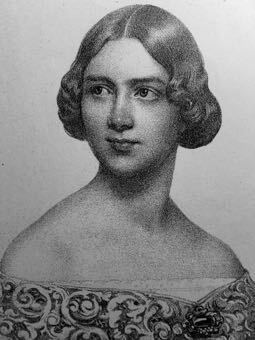 After 1850 come the names of those great German singers, Therese Stolz and Waldman, Aglaja Orgeni, Taliana, Sophie Loewe, for whom Verdi composed three operas, Nachbauer, Robinson, Reichmann, Noldechen, Emmy La Grua, Catarina Eveis, Lola Beeth, Vally Schanseil, Ginele, Schmittlein, the Countess D'Edler, the morganatte wife of the late King of Portugal. 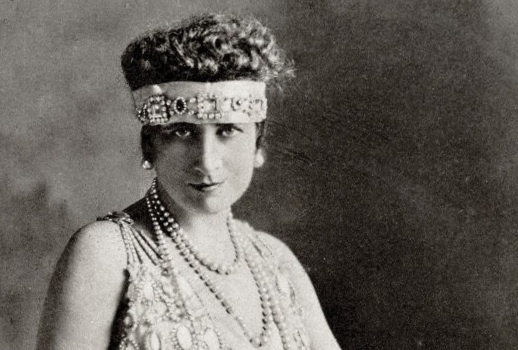 Among the French singers I noted Nicolini, Paul L'Herie, Derivis, Paolina Vaneri-Fillipi, Nandin. 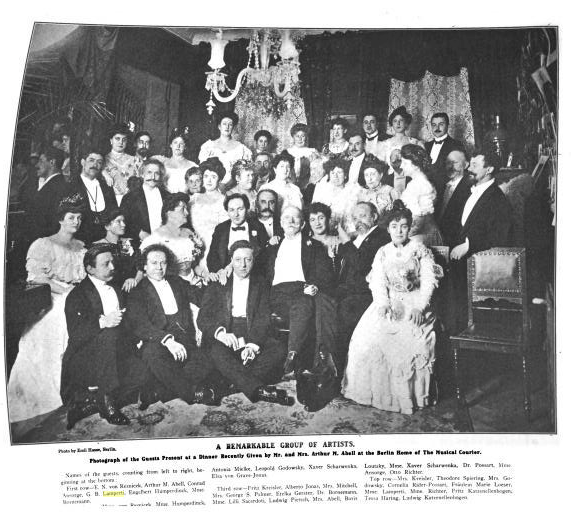 Among the singers of various nationalities whose lessons I was privileged to hear were our own favorites, Galassi, Campanini, Perotti, Alvary-Achenbach, Emma Albani, Emma Thursby, Edward Scovel, Herbert Sims Reeves: the delicious-voiced Spanish tenors Gayarre and Aramburo, Alvina Valleria, Marcella Sembrich, Marie Van Zandt, Hope Glenn, Carlotta Elliot, Herbert Thornyke, Barrington Foote, Isadore de Larra Tellini, Grossi, Levasseur, not to forget his son Battista Lamperti, who was teaching in Dresden, and William Shakespeare, and his daughter-in-law, Madam Alpina Lamperti, who are teaching in London. But I must stop somewhere! New York Tribune, New York, May 20, 1892. 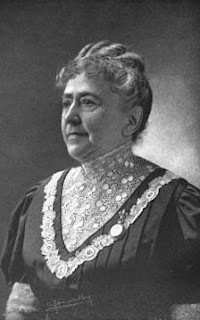 Lillie P. Berg (1845 - 1896) was born in New York City, and spent her childhood in Germany. Petite with curly blonde tresses, Berg attended the Royal College and Conservatory of Music in Stuttgart, studying voice and piano, where she came to the notice of the Emma Albani, who sent Berg to her teacher, Francesco Lamperti. Berg remained with Lamperti for three years as student and accompanist. Possessing a "clear soprano voice," she also studied with Theresa Brambilla, Mme. Fillipi, Julius Stockhausen, Erminia Rudersdorff, Mathilde Marchesi, and Enrico Delle Sedie. She returned to New York in the early 1880's, where she appeared in recital and private musicals. 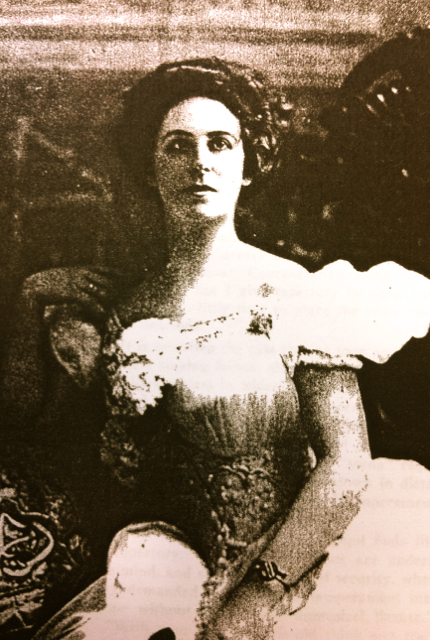 By the 1890's, she had become "the most fashionable" voice teacher within the city. In 1893, Berg's students and friends organized a "testimonial benefit," gathering over $1500 dollars ($40K in today's dollars) for the successful teacher and performer who had been ill for over a year and had fallen on hard times. 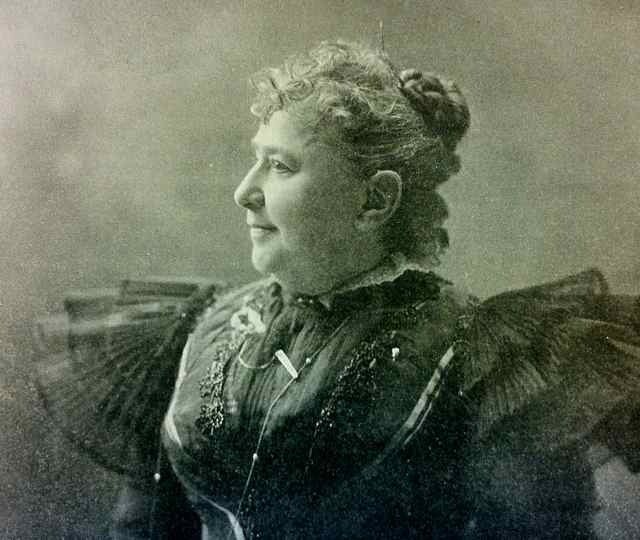 Berg resumed teaching in 1894 and continued until 1896, organizing recitals and choruses—and was known for being the first woman in America to wield a baton at a public performance. Speaking five languages fluently, Berg centered her teaching on Lamperti's method, in which she was recognized as an authority. I snapped this photo a few days ago, during a snowstorm, while standing with my back to the entrance to the New York Public Library for the Performing Arts at Lincoln Center. Truly, it is one of the great music libraries of the world, and where I have spent a significant amount of time. On that score, I believe I can trace my curiosity in historical vocal pedagogy to my studies with Margaret Harshaw; specifically, a question I was asked during my second lesson. I had not been in her presence more than thirty seconds when she looked me right in the eye and said: "So.....what did you learn since I saw you?" This told me that it was my job to figure things out. Right now, I am looking for biographical data for an elusive fellow who made a significant contribution in the late ninetieth century—a student of Manuel García actually. While I've found quite a bit of material, I have yet to divine the gentleman's birth and death dates. You'd think this would be a simple matter until you've found yourself confounded by multiple dead ends. What to do? You ask for help, review your resources for the umpteenth time, get creative with your search terms, and keep digging. 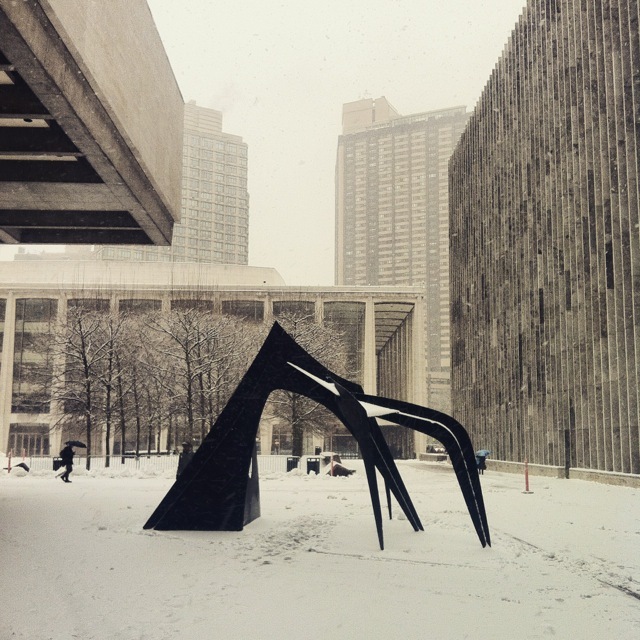 Photo Credit: Calder sculpture on the Lincoln Center Plaza in front of the entrance to the Performing Arts Library by Daniel James Shigo. Singing can never be taught or satisfactory explained by articles or books, for no matter how lucid they may be, no one can follow directions with any degree of advantage without the aid of the ear, under the guidance of a teacher, for set rules and directions in nine cases out of ten would not suit the case. A method to success must be adapted to each pupil and his own individual requirements. Singing should never be taught as a difficult thing to do. A pupil must learn that every tone must have its place, that the resonance of each tone can be augmented or diminished at will, that its quality can be changed to many qualities, that the location of a tone must be mental before physical, with a knowledge of it position before emitted, that doubt as to striking it, reaching it, or how it will sound is simply out of the question and a matter of ignorance. The first thing I tell my pupils is that they must separate the singer from the student, for no pupil can afford to serve two masters, and that the one who thinks and reflects upon the lesson will reach a point the plodder never sees, even at a distance. One can be a most intelligent person upon every other point and yet be a downright idiot in his knowledge of the requirements necessary to the successful vocal artist—even the subtilty of the work, dealing as we do with the unseen, is something that must be felt to be understood. What is tone placement? Why do some teachers teach as correct what others look upon as a fault? Of what use is a method, to reach a point or to stamp a pupil with teacherisms? What is the standard of a perfectly trained voice? Before placing a voice all bad habits, natural or acquired, which impede the freedom to tone and make it impure must be removed and all the faults located; then each tone, according to its position in the vocal range, must be carefully studied by the teacher to determine the cause of its weakness, power, quality &c. Experience with voices should bring a teacher to a quick solution of the difficulty. I have studied with other world renowned masters, such as Delle Sedie and Viardot-Garcia, but the bone and muscle of my work I owe to the one and only Lamperti. Madam Florenza D'Arona was as student of Francesco Lamperti, and received a diploma from him which allowed her to teach his method. 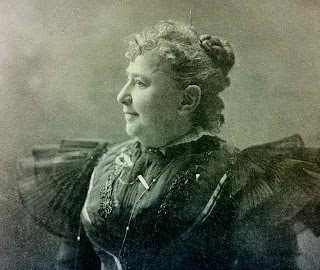 A contralto with a huge instrument, D'Arona experienced a good deal of success in concert and opera before marrying, which seems to have ended her career—a not uncommon occurrence for women during the late 19th century. Click on her label below to find additional posts. The quotes above have been sourced from the Musical Courier, which was published in New York City every Monday and Wednesday from 1880 until the 1960's. I skated through the icy streets to Alice Tully Hall last night to hear the luminous tenor Matthew Polenanzi and his eminently able pianist Julius Drake in recital, and before I could purchase a ticket at the box office, found a lovely lady pressing one into my hand! This gift proved to be only the first of many of the evening, the collaboration between Polenzani and Drake offering listeners one jewel after another: Beethoven's Adelaide, five songs by Liszt, Satie's Troi mélodies, Ravel's Cinq mélodies populiares grecques, and Barber's Hermit Songs. Polenzani's singing is pure bel canto. Youthful, elegant and effortless, whether he is pulling out all the stops or singing a beautiful mezza voce, his voice carries into the hall, shimmering and caressing the ear with bell-like tone. He can act too, his long experience on the operatic stage enabling him to bring out the character of each song in a convincing, forthright manner without compromising an ounce of vocalism. In fact, his instrument is so well-tuned that the emotions and thoughts conveyed seem larger than life—archetypal even. 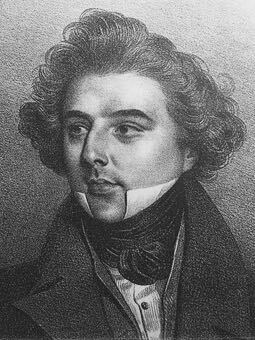 The pleasure of hearing Polenzani's clear diction and pure Italianate tone cannot by underestimated, if only because it is so unrepresented by his fellow artists today. He avoids the mouthed, muddled or mechanically-made sounds too often heard. As such, the man is an object lesson in the principles of the Old School, his voice gaining width and becoming even more lustrous since first heard by this writer at New York City Opera about 15 years ago. Polenzani studied with the legendary Margaret Harshaw, and after her death in 1997, has continued study with Laura Brooks Rice—a fellow student of the doyenne of voice teachers. First—The Physical, the lowest order of singing and singer, the prevailing type. Second—The Mental, a much higher order than the physical and when musicianship is added, the mental singer, the singer with but little or no temperament but with technic and power, is often quite successful; at least from a financial standpoint. Third—The Emotional, the singer who sings with body, mind and soul, the singer who appeals to you even though the voice may not be great. But when voice and musicianship are combined, the type that becomes the great singer of the world. Myer, Edmund, J. The Vocal Instructor, 1918. Photo Credit: Biographical Card File, New York Public Library of the Performing Arts. There are many opinions on the subject of vocal registers. Unpedagogic scientists, enthusiastic with results of laryngoscopic experiments, have hastened to conclusions which teachers will not accept; while unscientific "maestros," trusting too much to the accuracy of their refined musical ear, have rushed pell-mell into the discussion of a subject, about which they know little or nothing. Sir Morrell Mackenzie, in his excellent work, "Hygiene of the Vocal Organs," defines "Registers" as "the series of tones of like quality, producible by a particular adjustment of the vocal cords." He then very wisely adds that, "strictly speaking, there is a different register, i. e., a certain appropriate condition of the laringeal orifice for every note, but the actual mechanical principles involved, are only two." If this be true, would it not be better to define register in terms of the mechanical principle involved and thus let us think more clearly on the subject? His division of "long"' and "short" reed registers is good from an anatomical point of view; however, inasmuch as it involves consciousness of muscular activity in the throat, it is liable to injure the singer permanently. In this connection it is well to recall "that the throat was made to sing, not to sing with." It is generally accepted that the human voice has three registers,—head, middle and chest, and, if we can classify falsetto singing as a register, there are four. I agree with Sir Morrell Mackenzie, who makes himself understood in his "Hygiene of the Vooal Organs," that by the greater resonance in head or chest there are only two registers, Head Register and Chest Register. On this ground, and from my personal view and experience of resonance of the human voice, I would like to reduce all those registers into a single one. Since the voice receives its resonance and acquires more beauty by guiding the original tone from the Larynx through the nasal bridge or human sounding board to the osseous framework of the face to awaken the overtones, I prefer to call it Facial Register. But "the difference between artistic and inartistic production of the voice depends far more on the management of the resonators than on the adjustment of the vocal cords." Here he lets a flood of light in upon the subject; and since what he says is true, a far more consistent definition of registers would be the following: a series of tones of like quality produced by the vocal cords and determined by the predominance of head or chest tone resonance. Then there are two registers, and when all tones are properly placed in the acoustic chamber, i. e., the nasal bridge, the chest well expanded, and the impelling power of the diaphragm well managed, there is no danger of a break, and the voice is equalized throughout. In the higher tones there is a predominance of head resonance, and in the lower tones there is a predominance of chest resonance. The physiological cause for this may be illustrated by the harp whose long strings produce the low tones and whose short, tense strings produce the high ones. In the production of high tones the entire larynx is at greater tension; these resound more easily through the acoustics in the facial sounding board; but in low tones the larynx is more relaxed, and its cartilaginous surface vibrates so strongly that the resonance is imparted more to the bones of the thorax,—the chest. From this it may be seen that a full, powerful, magnificent tone is best obtained by expanding the chest to as great an extent as is consistent with bodily ease. Some male singers expand their chest so well that the resonance of their tones swims along every bone of their body, and even causes the floor upon which they stand to vibrate. Experience and common sense teach, that, since the object desired, is to equalize the voice, it is best to have the pupil with well inflated chest direct all tones to the facial center, where they may tingle with brilliancy. In conclusion, it would be well to state that Sopranos should not attempt to imitate the voice quality of Contraltos, nor. should Tenors imitate that of Bassos, and vice versa. The voices in their characteristics differ from each other by reason of their anatomical construction. It is extremely dangerous for sopranos and tenors to force their voices for the production of low tones, as this causes too great a relaxation of the vocal cords, which may afterwards prevent the necessary tension for the high tones. The same advice applies relatively to the other voices. If singers go beyond their natural compass, they are bound to reap, sooner or later, the punishment of their misdeeds. Let me repeat what I have said in the last chapter: My old teacher, Francesco Lamperti, offers the following advice, which I heartily endorse: "Students should never practice exercises to the full extent of their compass, either high or low, but they should stop within two tones of their limit. They will then gain these coveted tones with ease and their voices can never be injured by overtaxing." Cappiani, Luisa. Practical Hints and Helps for Perfection in Singing, 1908. Luisa Young was born in 1835, either in Italy or in Austria, depending on which source you believe. Whatever the location, she was educated at the Vienna Conservatory, afterwards traveling to Italy where she studied as a dramatic soprano with Antonio Sangiovanni, Luigi Vannuccini, Pietro Romani and Franceso Lamperti—whom she considered her principal teacher. She made her debut in 1859 after the death of her first husband, Gilbert Kapp, singing Wagner roles in Germany. Thereafter, she appeared in England—where she was presented to the Queen; then in Spain, Austria, Italy, Russia and Romania. Madam Kapp-Young came to America in 1867, where she appeared to much acclaim, singing in L'Africaine, Trovatore and Ernani. After subsequent seasons in Italy, she returned to America, and established herself as a voice teacher under the name of Cappiani (which she undoubtedly used in Italy to obtain engagements), first in Boston and then in New York City. 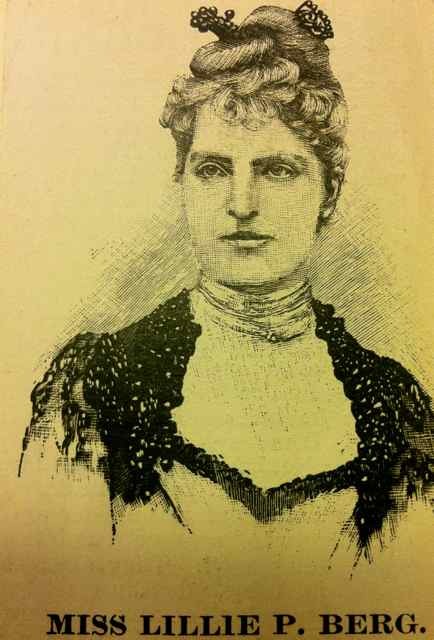 Cappiani was the teacher of Julia Etta Crane, a leading music educator in Pottsdam, NY (who also studied with Manuel García), and Lillian Russell, the famous American actress and singer. She died in Zurich in 1919. The value of Portamento to the pupil cannot be overestimated, since, by its aid, he learns how to use the abdomen forte muscles, and thus increases his volume of tone two-fold or three-fold. Therefore, Portamento, when correctly made, is the best means to develop the voice in quality and quantity. When the middle notes are weak, begin with the Portamento of the vowel from a high tone downwards, thus bringing the brilliancy of the high tones to the lower ones. To develop the high tones, by the upward Portamento, the lower (beginning) tone must always be taken softly, as the sway of the vowel by the impelling power with the vowel reflected in the belt muscles (transverse muscles) gives the tone great brilliancy and power. The following illustration will help the pupil to grasp the idea. Looking over his book on singing with Lamperti, I said, "Dear maestro, why have you made so many arches between the notes? Is not one arch enough?" He answered, "To bind them together." "Yes, " I said, "I know that, but one arch is enough; for what are the others?" He said again, "For binding them closer together." But I still insisted, "What are the third and fourth arches for?" His reply again was, "To bind them very much together." More I could not bring from him. This was his only explanation. I did not dare ask him more, lest I should irritate the old man, but he left a perfect blank in my mind as to what he meant with his doubled and redoubled arches over the notes for a Portamento. Having discovered that in a well-formed tone it is the vowel which must prevail, I was convinced that it is the vowel which represents the road from one tone to the other. Lamperti's "binding" was thus successfully effected. On account of this experience I change the phrase used by others in regard to Portamento, and instead of saying "bring the voice over to another tone," I say "bring the vowel over to the other tone, high or low," and the voice enclosed in this prevailing vowel must go with it, and Lamperti's four arches exist in the vowel. The voice can go over without carrying a distinct vowel (which is bad), but the distinct vowel cannot go over without the voice, therefore the vowel guides the voice, and this being correct, forms a perfect Portamento. The well made Portamento develops the voice marvelously in fullness, roundness and power. For further perfection of Portamento another consideration is necessary. Very often pupils make too little or too much effort (usually the latter is the case) in the transverse muscles, causing the vibrations to overlap each other, as though they were plaits, or forming little crevices. In starting on the arch from the first note, or in arriving at the second note, to no emphasis too much. An illustration to the purpose bring this Portamento always right; therefore I say, "Don't think you will take another tone, but imagine the starting tone is traveling up to the place where the higher note stands, or down to the lower one, and carry there the vowel (the arch) of the Portamento uninterruptedly and smoothly." It follows that the Portamento is the mother of Legato singing. These arches can be done so quickly that they become mental arches only, and that results in Legato singing. A word of warning is necessary here—avoid confounding the Portamento arch with marks used to indicate Legato, phrasing, or triplets. Serious students of the voice are encouraged to study the Janet Spencer gramophone recording of portamento which accompanies Hidden in Plain Sight: The Hermann Klein Phono-Vocal Method based upon the Famous School of Manuel García, the recording itself being a perfect example of Cappiani's instruction. Links to both book and recording can be found in the right hand column on VoiceTalk. Students are also encouraged to study page 20-21 of Francesco Lamperti's Guida teorico-pratica-elementare per lo studio del canto, which contains the "arches" which piqued Cappiani's curiosity. A voice teacher once said to me: "We must teach singing by anatomy and physiology of the throat. We must know exactly which cartilage, mucus membrane, false or true vocal chords, fibres, etc., we apply for this or that tone." With a smile I replied: "This you can never do, as a tone of the human voice does not depend upon one cartilage or one membrane etc." The ribs, with the intercostal in unions with the acoustic chambers (nasal bridge) and the diaphragm and abdominal muscles for breathing. Study of the throat muscles, etc, is neither essential nor desirable for the student of singing, as giving attention to them usually results in a tightening of those muscles, which produces throaty tones. The larynx, a wondrous, subtly built instrument of still more wondrous mechanism, is a complex apparatus. In its action for bringing forth the different tones, we cannot detect in which tones the several fibres, cartilages membranes, etc., are at work. Their actions are in union for the pre-convieved tone. 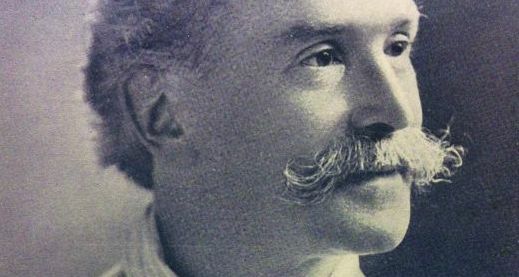 Sir Morrell Mackenzie, the eminent throat specialist, says in "Hygiene of the Voice": "It would be hopelessly impossible to count the movements of the muscles which work the vocal chords." The famous vocal teacher, Trivulzi of Milan, said: "To be a good vocal teacher depends on one's refined ear." It was he who brought forth not the musical world so many celebrities, including the tenor Rubini, the soprano Frezzolini, and others. Frezzolini was to far from seventy when I hear her sing divinely and with a fresh young voice, the aria from "La Sonambula," vocalizing with greatest ease the runs and trills in the cadenzas. At this age, was that not proof that she had the correct tone-production and that it was possible to preserve the voice through a life-time? Lamperti, as a youth, was the accompanist of the famous vocal teacher, Trivulzi, and in listening to the well-produced perfect tones of Trivulzi's pupils, his ear being naturally refined, he became Trivulzi's successor, at the latter's death, and in his turn, made celebrities from common singers, thereby gaining renown as a vocal teacher. 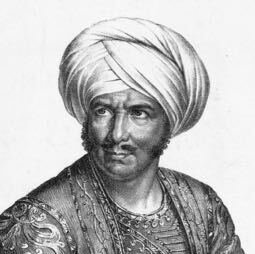 Lamperti did not say to his pupils: "For this and that tone, use the crico, or thyroid, or arytenoid cartilage," but to correct a bad tone, he said simply, "Do it otherwise," and was not contented until the pupil had found the right way of tone-production in a perfectly free, elastic vowel, not stiffened in the throat. Could Trivulzi and Lamperti hear of these modern anatomical teachings, they would have a good laugh in their graves. Cappiani, Luisa. Practical Hints and Helps for Perfection in Singing, 1909. Refined ear versus stacks of facts? That's the juxtaposition or tension between approaches Madam Cappiani was describing in Practical Hints and Helps for Perfection in Singing in 1908. Has much changed since then? Yes, we know a lot more facts about the vocal instrument, but the refining of the ear? That's a whole other matter, one which is renewed with each generation, which is why I often refer to singing as a language. While we will undoubtedly accrue many more facts about the voice as time and research allow, the truth of the matter is that having access to facts will not lessen the time it takes to learn to sing, which takes repetition and immersion—just as language acquisition does in the child. To be sure, there are those who come out of the box singing quite well (Tomatis was the first to posit that the child can hear the mother's voice in the womb), but even for these students, the learning curve, especially as classical music is concerned, is rather steep. With this in mind, it is certain that singing is a matter of the ear, even for someone like Mandy Harvey who sings well even though deaf. Having sung quite a bit before losing her hearing, Harvey demonstrates that singing, like listening, is an active process, the guiding force of the proprioception of vibration being a vestibular function of the ear. Madam Cappiani was a student of Francesco Lamperti.